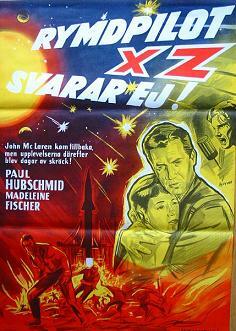 The Day the Sky Exploded (1958) -- Full Movie Review! 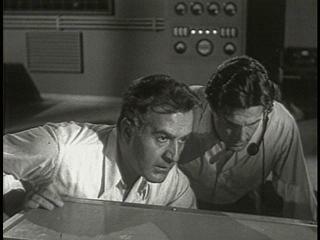 The Day the Sky Exploded is an Italian production of a giant-asteroid-hitting-the-earth science fiction film. This one has some potential, but is undermined by overuse of cliches and stock footage and some of the thickest technobable I've seen in years. Still, I kind of liked it. First released in Europe in 1958, it took a while for it to be picked up by an American distributor. Excelsior Pictures finally bought it and did the English dub, but it wasn't released in America until September of 1961. I will be using a new 2005 Brentwood DVD for this review. The film is in black and white and runs 82 minutes. 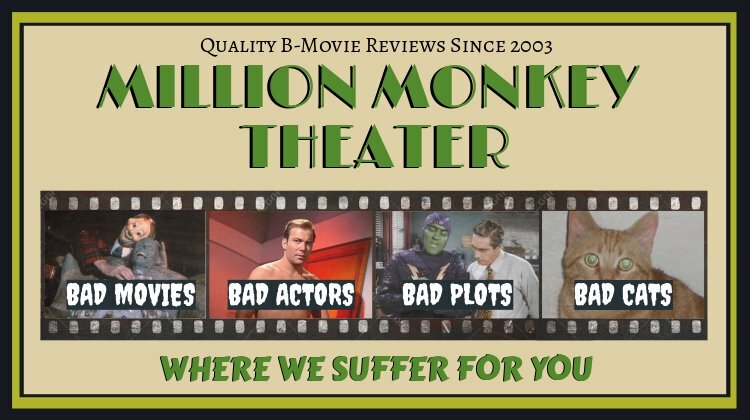 I was pleasantly surprised by the quality of the film stock, which is clear and crisp, except for the stock footage parts. And that's perhaps the main problem with The Day the Sky Exploded, the copious, egregious Godzilla-like use of industrial stock footage for nearly every scene that has any action in it. The quality of these clips ranges from clean to thickly grained, with more towards the later, unfortunately. It was directed by Italian Paolo Heusch. Heusch would be a b-movie specialist for the rest of his short directorial career, helming such gems as 1962's Werewolf in a Girl's Dormitory and 1968's Diary of a Rebel. The cinematography is the work of Mario Bava, the now-famous cult movie director. Before The Day the Sky Exploded, Bava had photographed about 40 Italian movies, but hadn't yet really taken the director's chair with any consistency. He had, however, just gained a level of success as a fill-in director for 1957's Lust of the Vampires, which was a fairly influential horror movie. He's without a doubt the "biggest name" attached to our little film, though in the opening credits he's listed as "Mario Baja". Ok, a few things to start out with. This movie is tough to watch, what with all the stock footage, fuzzy science logic, and an insistence on Star Trek-like technobable. I'm sure that they thought it would wow the audience, but all the dry boring science jargon spouted off every other sentence gets confusing after a while. It doesn't help that 90% of it is pure crap. Nearly all of this movie takes place in on a rocket base in Australia (though most likely filmed in Italy). All the scenes that take place off the base are stock footage, allowing them to only use one set. This one set is redressed several times and many of the extras appear in numerous scenes as different people. I would guess that principal photography for this film took less than two weeks, if that. The actors all needed therapy after having to read that script. As well, in this movie's timeline, set roughly in the early 1960s, the Russians are working with the western powers on this space project. There also seems to be a higher level of diplomatic and military cooperation than in real life, perhaps showing an optimism on the filmmaker's part. There's very little of the "commie bashing" found in American sci-fi movies of the same era, which is refreshing. I have a particular fetish for those spinning newspaper frontpages so common in these types of movies. This movie will give me many of these, including quite a few in an opening pre-credits sequence. The terrible pan-and-scan transfer cuts many of the words off on the edges, but there's still much to see. They are shown in quick succession superimposed over a collage of images of rockets and jet planes. I recognized some Nike missiles, A Royal Air Force BAC Lightning interceptor and a lovely Royal Air Force Avro Vulcan bomber. There are newspapers from France, Russia, Italy and Germany, but I can't read much of them as I don't speak the languages. There are three English-language papers, though, loaded with quirky grammatical errors. The first is The New York Times, which proclaims "Last Minutes Flash News!! Russe-american agreement for launching of atomic missile to the moon." 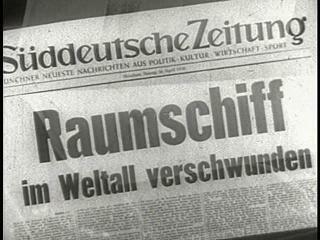 The second is the News Chronicle, which announces "Atomic Moon-Ship Will Be Launched In A Few Hours." Below that headline you can see a few other stories, including "They will be the next jazz 'greats.'" The last paper is The Times of London, which asks "Who Is To Be The First Interplanetary Pilot?" From this paper we see that today's date is April 24, but the year is illegible. We now have our opening credits, with the cast and crew cards placed over another English-language paper frontpage. You can only read a few areas of the paper, as it's mostly obstructed by the cards. One article is headed by the fragment, "JFK sees 10 yrs. of r...". 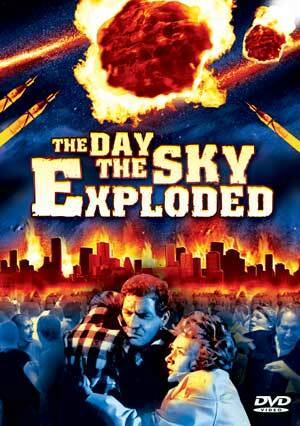 This is cool because The Day the Sky Exploded was originally filmed in 1958, long before Kennedy became president. 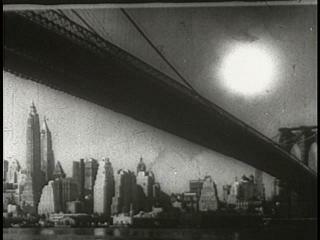 When Excelsior Pictures reedited it for American release in 1961, they added this credit sequence, including a paper from after the election. See what you notice when you look closely? From here will soon be launched the "XZ" rocket, a super-high-tech spaceship which will be the first to send a man into space and return him alive. We see it first as a nice matte shot in the background, looking all cool on a gantry lit by spotlights. The XZ is "atomic-powered", which is a radical design, and is equipped with an escape capsule for the pilot in case of emergencies. A media circus is in full swing, and a hyperactively chipper television reporter will provide us much exposition in the coming scenes on this "most ambitious scientific adventure of all time". We learn from him that the ship is taking off very soon and the single pilot will be American John McLaren. We go inside the control room, which is a bare-bones version the NASA Johnson Space Center you saw in Apollo 13, amongst other films. Here we meet a few of our rather large cast. First we have to meet our film's hero, American astronaut Professor John McLaren, played by 41-year old Swiss actor Paul Hubschmid. Hubschmid would end up appearing in 98 movies over his 50-year movie career, and might be Switzerland's most famous movie star (not saying much, good thing they make great watches and quantum physicists). The only one of those 98 that might be recognized by American viewers would be 1953's The Beast from 20,000 Fathoms. 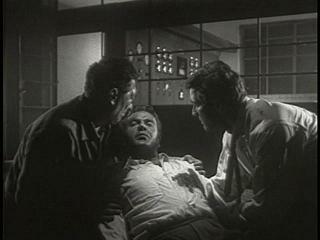 In that film, going under the name of Paul Christian, he starred as the heroic Professor Nesbitt. He's a tall man with typical hunky good looks. In the face, he looks a smidgen like Jeff Goldblum or maybe Dan Aykroyd, circa Ghostbusters. In the control room are also about ten scientists. They all have roles in our movie, some larger than others. I will introduce them as we go along. These are the men and women who have designed, built and nursed the XZ from drawing board to today. As such, they all have a large stake in the coming flight. John is told that his wife is waiting for him and he goes to see her. 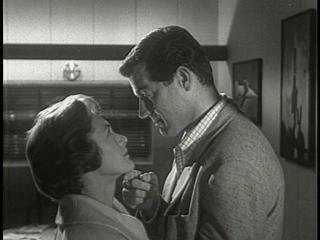 Mary McLaren and John have a strained relationship due to John's recent total single-minded focus on the space flight. She still loves him, and he her, but they are under so much stress that they are taking it out on each other. There is also a little boy about eight-years old named Dennis who is caught in the middle. 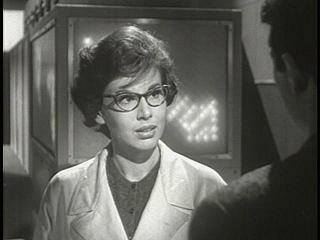 Mary McLaren is played by Brazilian actress Fiorella Mari. She's a rather unattractive woman, quite thick in the hips, with a bad 1950s hairdo. She has only two acting styles here, hysterical wife and hysterical mother. Totally unrelated to our movie, but "Fiorella Maria" with an "a" on the end is actually Miss Peru 2006! Mary is worried about John's flight, "we'll be in different worlds", she bemoans. John is surprisingly cool and unemotional. They hug a few times, but most noticeably they never kiss each other, which is odd. I wonder if this was the actors' decision or was it in the script not to show much affection. It's time for the launch now and John puts on his space suit and is taken out to the rocket pad. It's 3am when the launch is scheduled and the pad is lit only by floodlights, with a haze of smoke for that special moody feel. John goes up into the cabin and everyone starts punching buttons. We will watch the entire flight to come from the base control room. The countdown ticks to zero and the XZ takes off in a blast of fire and smoke. The launch is a mix of a lame plastic model and stock footage, note that the stock footage rocket doesn't look anything like the model rocket. The model XZ is typically 1950's design, with a tapered body and short stubby wings, flames roar out the bottom. Up, up the rocket goes, with no problems. Entering orbit, the rocket does a complete circle around the planet. As it comes back over Australia, the control room crew contact John and ask how it's going. John is clearly tense and fighting his emotions, but then again, he's the first man in space so that's to be expected. Kudo's to the script for not making him arrogant or worse yet funny in this scene. All is well with the ship and everyone is relieved and happy. The rocket will orbit the Earth once more and then will fire its rocket motor and head out to the moon. It will circle the moon once and then return to Earth. The entire flight is expected to take six days. Fairly ambitious for the first space flight, eh? We have to wait a full 45 minutes until the XZ comes back into Australian airspace, the time interval of the orbit. In that time we get to meet some of our scientists as they celebrate the launch and double-check all the numbers. I'm not going to fully introduce everyone here, just the ones who will play big roles. First we get to know our Romantic Subplot, between two of the scientists. 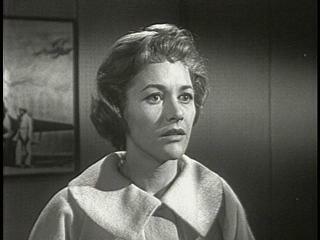 The woman is the base computer expert and brilliant mathematician Doctor Katy Dandridge, played by Madeleine Fischer. Fischer had a short career in Italian cinema and this was her last credited role, which is surprising because she does a good job here. She's a quite attractive woman in her late twenties, playing the cliched role of all-business professional woman on the outside, but just a scared emotional woman on the inside. Her romantic suitor is Doctor Peter Leduq, played by 31-year old Argentine actor Dario Michaelis. 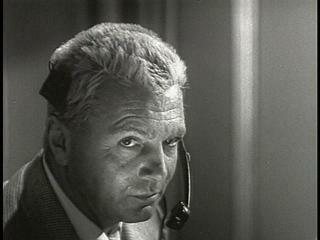 Michaelis had an uneventful career in European movies, with 25 roles. Of those, 11 were as an uncredited extra. 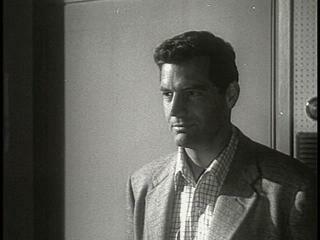 His best role might have been as Valentin in 1957's Lust of the Vampires. He's a tall blonde with a humorous streak. Their relationship throughout the first half of the movie is somewhat one-sided. Leduq tries to woo her, but she's more in love with her computers than him. He seems at times to be a slimy lothario, even making a bet with a fellow scientist that he can get a kiss out of Katy (he wins), but at other times he's kind and generous. He also can spout some great come-on lines, like, "your cool beauty freezes my powers of concentration" and "since I met you I have thought of no one else". Unfortunately, as the movie takes on a frantic tone later on, their relationship takes a back seat. Almost all of their one-on-one scenes take place in the "computer room", where banks of flashing lights and keyboards line desks and walls. Much is made of the fact that the computer (called a "calculator" occasionally) is climate-controlled. If the temperature varies too much, it will shut down. Remember this for later. There are a number of English language signs on the walls of the computer room, including yet another reminder that "variations in temperature can damage the machines" and "Only Persons Holding Pass 34 Allowed" and "Bad Screenwriting Can Cause Blindness and Ruination of Careers". Ok, that over, we see that John and the XZ are now back over Australia and radio contact is reestablished. Everything is going fine and they start the countdown to fire the main rocket motor for the flight to the moon. As the third motor fires, something goes terribly wrong. The rocket begins to spin out of control and radio contact is lost with John. In the control room there is panic, everyone yelling and running around. Stock footage telescopes pick up the XZ, now "completely off course". They also pick up the escape capsule, John is now returning to Earth. Stock footage radars track him as he descends on the western coast of Australia, where a stock footage Bell 47 helicopter picks him up and brings him back to the rocket base. Back in the base, Mary switches into full hysterical wife mode as she goes to see John in the hospital. He's unhurt and she's relieved. Note once again that they do not kiss each other. Some of the scientists come in and John tells them about the malfunctioning steering gear and the spinning rocket. They ask him if he turned off the atomic reactor, and he says that he couldn't because the controls went out. The scientists are shocked, as is John, who assumed that they would shut off the reactor from the ground when he lost control. Now the XZ is flying out into space on an unknown course, its nuclear reactor still humming. This isn't going to end well. Now we get some more great newspaper frontpages announcing the failure of the rocket. The only English-language paper, The Chronicle, says, and I quote, "Atomic Missile Within The Interplanetary Space" and below that, "John Safe". A few days later, they finally pick up the wayward XZ rocket. The radar echo is faint and they will have to crunch the numbers to see where it's headed. At the same time, we hear on the radio that millions of animals, both wild and domesticated, are suddenly fleeing en masse to the interiors of every continent. 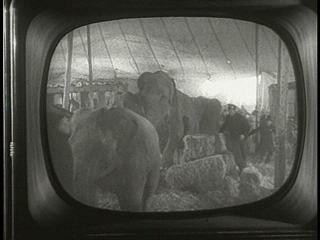 We get a few stock footage shots of animals rampaging, including elephants and horses. Clearly, the animals are sensing something terrible about to happen. The next day, stock footage observatories register an atomic explosion in the area of the "Delta asteroids". This puts the scientists in a frenzy. They put the facts together and claim that the XZ rocket must have hit something in the asteroid belt and exploded. Soon, strange unexplained glowing lights are seen in the sky over the Earth, frightening people and causing more nervous sweating from the scientists. These sightings look pretty lame on screen and don't make any sense at all once we know what is happening up there. Ok, just googled the hell out of the internet and can find no reference to the "Delta asteroids". Perhaps they are referring to the belt between Mars and Jupiter? That would work, I guess. I read several reviews of this movie and they must have been watching a different version because they thought that the rocket had hit the sun and that had caused the asteroids to mass. Is this what happened in the original European version? I'd love to know. At the McLaren house, Mary finally snaps under the pressure of being a fulltime hysterical wife. John has to stay at Cape Shark to help with the scientific investigation. They get into a nasty squabble here and Mary says she's taking the boy and heading back to New York. John says some things he doesn't mean because he is mad and they part ways. Don't worry, they will be fine, couples fight all the time. Mary takes the kid and leaves in a car for Melbourne to catch a flight back to New York. Back in the control room we get endless hours of technobable as the scientists try and figure out what is going on in space. The magnetic wave meter is pegged, the animals are freaking out, weird lights are seen everywhere and they still don't know the cause. Let me introduce to you a few of the Cape Shark scientists now. The only ones who will have roles in the coming action to speak of will be Professors Weisse, Boetnikov, and Randowsky. Professor Herbert Weisse is played by Italian actor Ivo Garrani, who in the 1970s crossed the Iron Curtain to appear in a number of eastern European movies from Bulgaria and Yugoslavia before returning to the West. 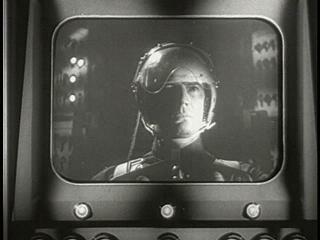 Here he plays a German rocket scientist. 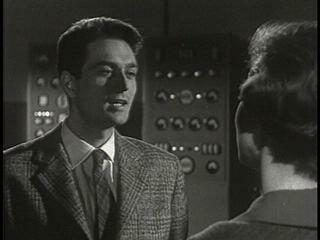 Professor Sergei Boetnikov is played by Frenchman Jean-Jacques Delbo. He's a Russian rocket designer. 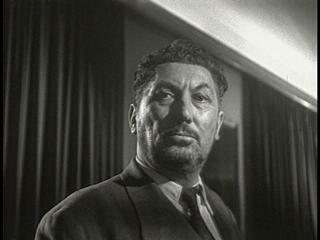 Professor Randowsky is played by Sam Galter. He's a tall Slavic blonde with a gravelly voice who is the Radar Specialist. Finally the scientists put it all together. It seems that the nuclear explosion in the asteroid belt has caused many of the asteroids to jump out of their orbit. Somehow, and certainly not by any known model of astrophysics I know of, the smaller rocks have coalesced into one big loosely held together mass. This mass is now headed for Earth and will be here in just five days! Damn! Total freak out now. The rocket base is locked down, the United Nations and the major world powers are alerted to the danger. A hastily organized scientific committee meets at Cape Shark. They determine that if all those asteroids hit the Earth it's over for us. The only hope is that calculations show that the mass of asteroids will graze the moon before hitting the Earth. The danger is doubled now, if the moon is knocked out of its orbit even a little, the tidal effects will swamp the coastal regions of the world. So the rush is on now to evacuate the coasts to the interiors. All nations mobilize their armies and emergency services and all transport is requisitioned. We get a huge chunk of stitched together stock footage of people fleeing by vehicle and foot, some of it from World War II films. The film quality is really bad in some of these shots, better in others. 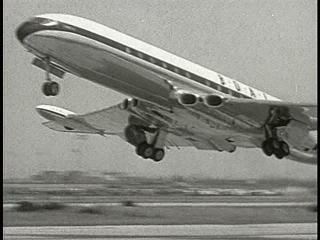 We get a one-minute long sequence of stock footage civilian airliners taking off from airports around the world. I recognize a Lockheed Starliner, a rare Vickers Vanguard, a Douglas DC-3, a huge Boeing 377 Stratocruiser, and an ultra-cool DeHavilland Comet. We also learn that Cape Shark is high enough to be safe and that the complex can hold at least 5,000 evacuees in shelters beneath it. We zip forward to the day that the asteroid mass is about to hit the moon. Our scientists begin to crack in different ways. Boetnikov finds religion, Randowsky begins to go mad, even Katy begins to lose control of her emotions. There is a general feeling that they have caused this disaster by mucking around with space travel. Feelings of guilt seep into conversations, especially with Randowsky, who is dangerously unstable. Good news, Mary and her son arrive back at the base. She didn't get on the plane to New York after all. John runs to see them and they make up. Again note that they do not kiss at all, despite the outpouring of emotions between the two of them. This is beginning to bother me. 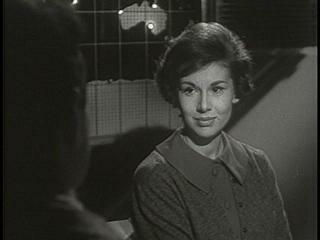 John has to go back to the control room, but he arranges a guard to take Mary and little Dennis to a shelter in the complex. Down below in the shelters, people start to lose control. There are fist fights and shootings as the police try and keep everyone from going crazy. Mary and Dennis are caught up in all this and are terrified. Up in space, the asteroid mass now grazes the moon. The "special optical effects" for this are beyond lame, seen mostly through the lens of a telescope. Surely many of the asteroids are destroyed by the moon, or sucked in by its gravity, but a large mass is still on a collision course with Earth. Randowsky now flips out, and starts raging about how this disaster is all their fault and the day of judgment is upon them! Somehow this lunatic raving gives John the idea that they can shoot down the asteroid mass with every missile in every nation's arsenal. As many as possible will be armed with nuclear warheads. They canvas the room and every nation agrees, Russia included. The Russian representative says that they have "twice as many missiles as America". Not at all true, but they didn't know that in 1958. The problem is that they only have about five hours and they must rely on the computer at Cape Shark for final targeting information. Why only this one computer is unknown, but it does allow for some exciting moments later on. So we now get a ton of stock footage missiles being prepped and armed. 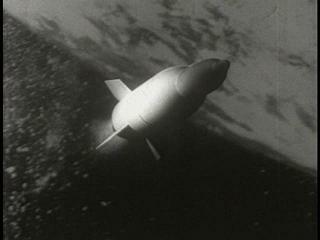 The producers scoured every film library available for every stock footage shot of a missile. These are all jumbled together in quick cuts without any thought of continuity. Down in the shelter there is a mass riot brewing as people run frantically around. In the next few minute of film, as Mary and the kid are rescued by John, we see something very amusing. They clearly only have about two dozen extras and they run back and forth across the screen, simulating the thousands of people they say are down there. There is one guy in particular, very tall with a floppy haircut, that we see run by at least three times. That's priceless. John comes to rescue Mary and his son. Somehow he finds them in the chaos and pulls them back to the control room to relative safety. No kisses. Outside, the approaching asteroid mass is causing terrible environmental effects. Wildfires rage and strong winds blow, clearly the end is near. Right before the latest targeting numbers are to be sent out to the missile bases, the main computer at Cape Shark goes down. The scientists run down to the room to find that crazy Professor Randowsky has gone totally mad. He turned off the air conditioning to the computer and it holding off everyone with a pistol. He is determined that mankind will not escape the wrath that God has intended for them all. So John, Weisse, Laduq and Boetnikov run down to the air conditioning room to confront nutjob Randowsky. They try and reason with him, but he's too far gone mentally to listen to them. They have no choice now but to gang rush him and hope that they can overwhelm him. Weisse takes a bullet in the chest as they charge, and Randowsky punches his way free and runs off. He doesn't get far as he grabs a power line and is electrocuted. As Weisse dies dramatically in their arms, they get the air conditioning back online. Weisse gives his life for the planet. The targeting data is fed to the world's missile bases. 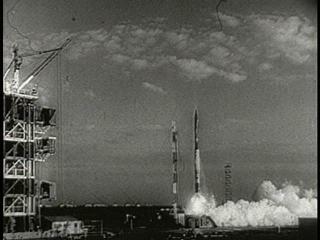 We now get a huge series of stock footage missile launches. Dozens of separate shots of every kind of missile, from ICBMs to short-range tactical rockets. John intones, "At this moment the safety of the Earth is dependent on the very missiles that were created for its destruction." This huge wave of missiles race towards the asteroid mass, now just a few tens of thousands of kilometers from the Earth. They hit with booms and pops, fragments and smoke gushing. Back in the Cape Shark control room they watch the instruments. The mass has been destroyed! Yes! No! Wouldn't there still be tons of smaller asteroid fragments still on the same collision course with the planet? Instead of many large hits, you now will have thousands of smaller hits. I still think the Earth is doomed. And all those nuclear explosions in the upper atmosphere have got to coat the planet with enough radiation to kill off millions. But it's just a movie. To close, John and Mary walk outside to see the rising sun across the beautiful land. They still don't kiss, I think John is secretly gay. We see Katy and Laduq hugging, maybe they will kiss later, I need to see a kiss! And that is the end. Thanks for reading. 12: Number of times you hear the repeated phrase "My baby!" in the audio track during the assorted evacuation scenes. I guess they only had a certain length of background audio and they just ran it in a loop. 5: Number of cigarettes smoked by our cast. 4: Number of unmarked Willys jeeps that appear in a group throughout the movie, all they had rented for the production. 1: Number of kisses by our cast, none by our hero. A cool poster for this movie's Eastern European release.